Synergies is the first solution in the world to use the business navigation system to assist enterprises in making smarter business decisions through the predictive analytics from artificial intelligence technology (SyGPS™). Enterprises need fast and convincing auxiliary information for business decision making, and Synergies’ artificial intelligence system can provide real-time and comprehensive information to the enterprises through deep learning and big data analysis. Synergies derives its technology from a powerful portfolio of various algorithms, including traditional machine learning models such as gradient boosting decision tree, recurrent neural networks of deep learning, and probabilistic graphical model that can measure uncertainty. 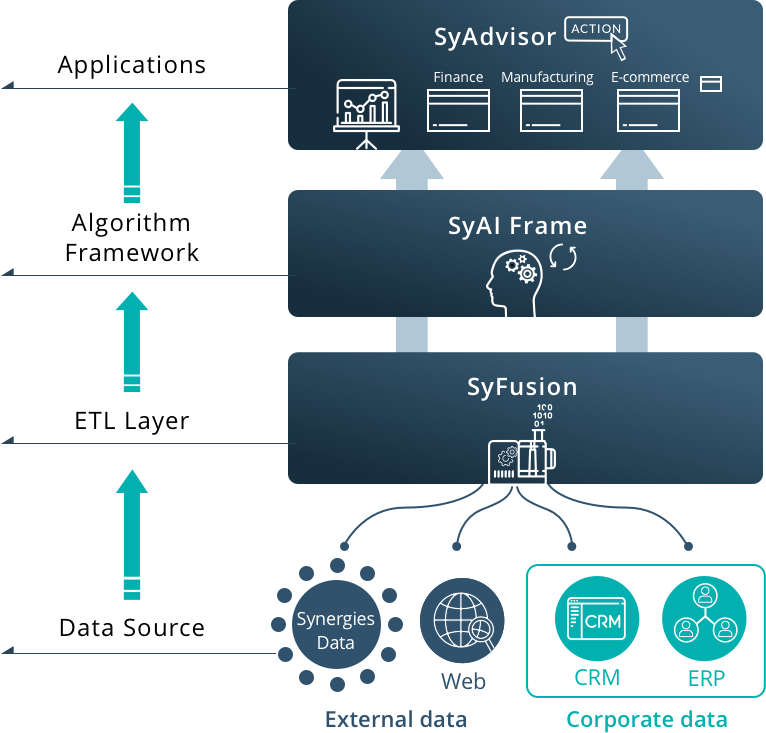 SyFusion is an end-to-end feature generation framework that automatically generates features from data through machine learning model and relationships between data. Therefore, SyFusion can perform feature extraction, regardless of external unstructured data or internal structured data from enterprises, for each subsequent data operations using artificial intelligence algorithms. In the past, large volumes of data were needed to compute accurate forecasts. Today, our SyAI Frame, an artificial intelligence framework built on a combination of different algorithms can process various data volumes and achieve accurate forecasts. Interested to learn more about our solutions?